Abraham Lincoln: Do you think we choose to be born or that we are fitted into the times we are born into? As I sit here writing this review of LINCOLN, the latest film from the figurative president of Hollywood, Steven Spielberg (WAR HORSE), millions of Americans are hitting the polls to vote in the presidential election. The race is incredibly close and there is much at stake. It is this current political climate that makes LINCOLN even more poignant than it inherently is, and elevates it to an even more meaningful place. As Spielberg positions Mr. Lincoln as a family man, as a storyteller interested in rewriting history, he gives the audience a president that is just as complex as today’s candidates. He also gives us a man that loves his country and its future so much that he transcends political party allegiance. Based on a densely worded and often surprisingly amusing screenplay by Pulitzer Prize winner, Tony Kushner, LINCOLN focuses its attention on the weeks leading up to his assassination in 1865. In these weeks, Mr. Lincoln (as embodied here by the almost always revelatory Daniel Day-Lewis) is about to be reinstated to his second term as President of the United States. The American civil war is in its 4th grueling year, with hundreds of thousands of casualties already counted and he, like a great deal of the country, is desperate for it to end. He will not allow that end to come though unless it involves the abolishment of slavery, the central issue to the war. With a divided house and a race to make change before the war is over, Mr. Lincoln sets out to add a 13th amendment to the Constitution abolishing slavery once and for all. How he goes about doing this though brings into question how far morality can be stretched in the name of the greater good. 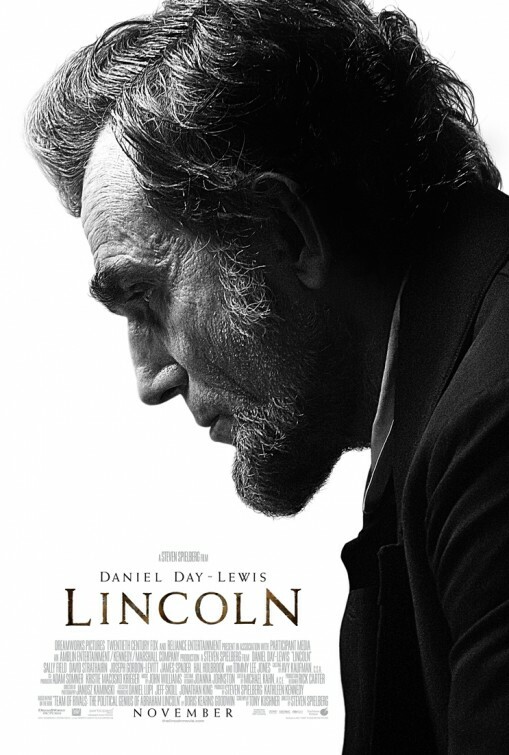 LINCOLN is far from Spielberg’s best work but, thanks mostly to Day-Lewis’s uncanny performance (seriously, someone needs to tell me how this man consistently transforms himself so brilliantly) and Kushner’s crafty script, it is still his best film since 2005’s MUNICH. Some of the more personal elements to the story, Lincoln’s complicated relationship with his melodramatic wife (Sally Field) and almost clichéd relationship with his eldest son (Joseph Gordon-Levitt) who wants to enlist against his father’s wishes, distract somewhat from the bigger picture. Fortunately, that bigger picture is plenty big enough to eclipse these minor missteps. We are talking about eliminating slavery after all, which was just as much a war of a different sort behind the political scenes as it was on the battlefield. And, as the 13th Amendment to the Constitution comes closer and closer to passing, LINCOLN becomes a truly liberating film experience. Great change takes great strength and even greater men of resolve and character. LINCOLN is a wonderful and welcome reminder that we are still capable of making such momentous strides to this day. How many sheep would you give Lincoln? I am thinking this movie might take off. We shall see! Thanks @mothermacs! Noted and corrected. Not sure how I missed that one. Cheers and thanks for reading! This is one that I keep meaning to go out and see but have yet to make it. From what everybody is saying it is a really good movie.